Have I mentioned I love Kerbal Space Program? I have been on board KSP since its Early Access days back in 2014. It swiftly became one of my favorite games of all time. A game truly like few others. It is both a serious look into the workings of real space travel and a light-hearted, humorous joyride. You need look no further than the original launch trailer. This is the image that pops into my head when I think Valentina Kerman. Always out there taking part on thrilling new space missions with the most excited smile in the galaxy. September is my month of birth, and as such I like to make a change of profile pictures. It’s good motivation to draw something. I described in detail the thought process of me creating new profile pictures in a previous post. The short version: This is as close as I ever get to cosplaying, and my pictures reflect a part of my personality or mood I feel comfortable displaying. So though I draw myself more than just once a year, I don’t always apply new self-portraits as profile pictures to represent me. I was inspired by this years awesome new release, the video game God of War. A former Greek god lives a reclusive life in the land of the Norse gods, and upon death of his wife starts on a life-defining journey with his son (a.k.a. “Boy”) to the top of the tallest peak in all the realms. Along the way they are confronted by numerous members of the Norse pantheon, such as Baldr, Freya, the brothers Magni and Modi, and Mimir who becomes a lasting member of their party. It is from him that the pair learn of the exploits of Tyr, the Norse god of war, who despite his title was actually a very kind, fair sort. The player never meets him in person, but his works are ever present throughout the land, as he labored to keep possibly world-destroying secrets out of the hands of the fearful and paranoid Odin as well as his gluttonous, aggressive and deplorable son, Thor. Following the inspiration I looked up what was known of Tyr. For a god of War and Glory, he was much more known for being an aspect of Justice. Giver of Law, they called him. The most notable story featuring him was the Binding of Fenrir, where he willingly allowed the giant wolf to bite his hand off, making the sacrifice needed to keep the dangerous creature bound by magical chains. He saw this not just as a service to the gods and all mortal beings, but also as justice to Fenrir himself. My choosing to become Tyr for this next picture has nothing to do with how I see myself. Based on what I know Tyr is a figure of great moral standards and self-sacrifice. A god known for being just and valorous in all circumstances. I am not like that. I do wish I was though. So this is me depicting my aspiration to be better than I am. Also we both share very old, mythological first names that have three letters and start with a “T”. So there’s also that. Picture is available on DeviantArt here. I rarely see the same movies as others do, even when I watch them. One thing I do with just about every story I experience is change things around a bit in my head to suit my own entertainment needs. I have an active imagination that way. On thing I like to play around with is the main character’s gender. Superman is my favorite superhero, and I often like to imagine how the story would have been different if Krypton’s last survivor was a girl. If these ideas are fun enough they get drawn. I haven’t posted in a while due to many things having arisen towards the end of the school year. On that subject, I am finishing my 3 year training in Education, during which I got to know a bunch of really awesome people. It has become customary for me to give the gift of art on occasion (birthdays and the like), but for graduation I decided to go the extra mile. I originally wanted to then link all my friends the music from the show’s opening to provide the proper mood and atmosphere. Instead I decided to get to work on what is to this point the single greatest THING I have ever made. Here’s to all the amazing people I had the privilege of attending university with. You guys are simply … super! 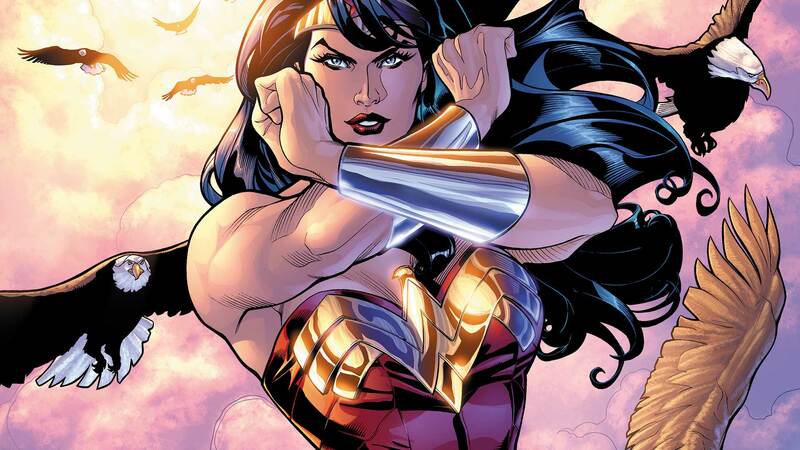 Wonder Woman is my second favorite superhero (closely behind Superman). While I was happy that she got her own movie recently, and that it seems to be very much liked, I can’t honestly say that I liked it. I did, but I also did not. The definitive version of Diana for me will forever be the one drawn by the Dodsons. Diana is the Superman of woman kind. A symbol all the good women are capable of being and strive towards. That includes toughness, power, compassion, and of course looks as well. No artist has ever hit the nail on the head as well in my eyes as these two. A few years ago I favorited a painting of Wonder Woman on DeviantArt by user Onibox, because it had her in an amazing, modern looking outfit. Inspired by those images, when I inexplicably got the urge to draw superheros again, I had to take a shot at it myself.